Did you know that your measurable level of intelligence (IQ), memory, focus, and overall brain power are not permanently set levels? And that, there are things you can do to make yourself much smarter, no matter your age? It's true, once believed to be constant beyond a certain life stage, mainstream science has now accepted that we all can upgrade our brain in many different ways. What then, is the number one method of building a better brain? Tip: Use the jump menu (below) for quick navigation. Contrary to the widely accepted scientific opinion of decades ago, the recently discovered "neuroplastic" nature of our brains means that our intellectual/ creative potentials are not set in genetic stone — there are certain things we can do to improve its performance. So, just like your leg muscles, you can beneficially build the strength and even the size of your brain in the healthiest and most natural of ways. Then, what is the best way to build a better brain? Meditation. Using the latest in MRI brain imaging technology, a landmark 2000 Harvard University study found that in both the short and long term, meditation practitioners naturally and beneficially increased the neural mass (gray matter) of the brain regions associated with long & short term memory, focused attention, deep thought, and overall brain power while simultaneously quieting the electrical activity within the regions associated with anxiety, depression, fear, and anger. Needless to say, the implications of being able to build a better brain through meditation are immense. Having a super-strong and fit brain opens the door to an incredible array of life-transforming benefits. Better memory? Check. More intelligence? Check. Higher IQ? Check. The list goes on. Meditation Enables "Whole Brain Synchronization"
In order to build your brain to higher and higher levels, your nervous system needs a workout. 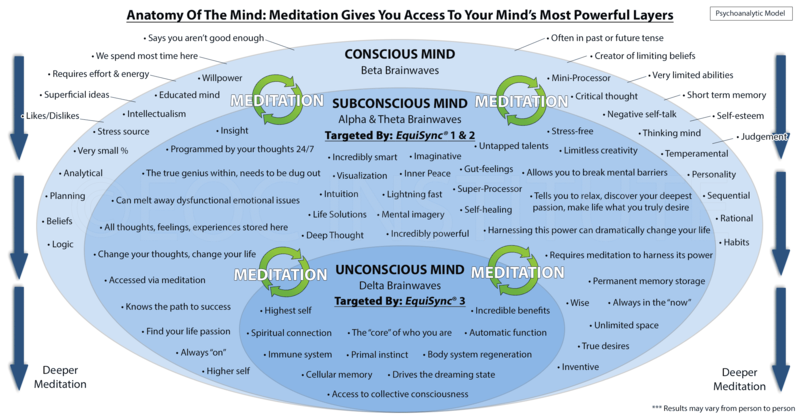 Luckily, the neurostimulation from meditation offers your whole nervous system an incredibly fertile atmosphere, triggering super positive transformations throughout your body, especially your brain. In time, your whole nervous system reorganizes and optimizes itself on progressively higher levels, laying a new foundation of neural pathways, opening up access between your left and right brain hemispheres like never before. This "full brain access" or "whole brain synchronization," as it's known among the scientific community, has the potential to transform your life in many ways, including boosting your brainpower, IQ, memory, and intelligence. Science really has only just discovered the tip of the iceberg regarding meditation's mesmerizing array of brain-boosting benefits. Your brain has two hemispheres, left and right. Left hemisphere thinking is best characterized as logical, practical, and mathematical — while the right brain hemisphere is linked to non-linear, intuitive, abstract, creative, and big-picture focused thinking. Can you guess which brain-half is dominant for you? Like a natural left or right hand, we all have our strong and weak brain hemispheres. Numerous studies have shown that humanity's greatest thinkers, inventors, artists, and scientists use both brain hemispheres together, in a much more holistic, integrated way. The question becomes, were they born this way, or did they somehow knowingly or unknowingly train their brains to reach such great heights? Is it nature or nurture? The results may surprise you. Including legendary Harvard neuroscientist Dr. Sara Lazar's work, countless brain imaging studies have found that for both new and experienced meditation practitioners, the degree of electrical activity and neural density / development to be incredibly balanced and symmetrical. Like finding a tennis player with equal sized arms, this is incredibly rare, with monumental implications. In short, if you want to change your brain for the better, you can. Meditation allows nurture to trump nature. It should come as no surprise that many of the world's most transformative, creative, and successful people practice meditation, with a staggering number declaring their practice to be a big reason for their long resume of achievements. While none of us need to change the world all by ourselves, a critical mass of balanced-brain meditation practitioners (including you!) could certainly spark the wildfire of upgraded consciousness we all so desperately need. What better way to generate planet transforming ideas than digging deep into the mind on a daily basis? Serving as the prime facilitator of information between your two brain hemispheres, about 10cm beneath your cortex, is a grand-central-station-like bundle of nerves scientists call the "Corpus Callosum." If you are looking to boost your intelligence, memory, and brain power then upgrading this brain area is critical. In addition to other inner brain circuitry like the feel-good prefrontal cortex, UCLA School of Medicine researchers found that during meditation this bridge-like, flat bundle of neural fibers becomes deeply stimulated in much the same way that a Tour de France cyclist's legs get a nice, super-healthy pump after climbing 6000+ foot Alpe d'Huez. Because of the brain's neuroplastic nature, meditation's incredible stimulus forces the integral (literally!) "Corpus Callosum" to strengthen and grow — in all the healthiest and best ways possible, effectively enhancing your intellectual capabilities on every imaginable marker. Sticking with the cyclist analogy, anyone who has tuned into the Tour de France on a lazy summer day has noticed the obvious strength, definition, and overall healthy appearance of the participants' legs. Wouldn't mind if my legs looked that (or at least worked like that! ), some of us might be thinking. How about if you could build your brain up to such a level? You can, meditation is how. Then, what kind of benefits can you expect with a stronger and healthier brain, specifically the critical "Corpus Callosum" region? Suddenly, higher levels of focus and concentration become available to you, a feeling of more brain power and clearer thinking, all combined with a greater sense of peace. You will notice a flowing river of insightful, intelligent, and creative thoughts. Your long and short term memory will sharpen. You will be happier, more optimistic, at one with the world. Financial, academic, and career success will come much easier, more naturally. All of these benefits do build one on top of the other, accumulating over time. Become a brain champion, meditation will get you to the top of the podium. Whether you are a college student cramming for final exams, a career-ladder-climbing professional looking for that extra mental sharpness, or a senior wishing to preserve your "golden year" mental faculties, you can certainly improve your memory and brain power no matter your place in life. Have you ever wondered why, after a super-stressful day, your memory goes down the drain? You can blame your body's main stress hormone, cortisol. When your back is against the wall, cortisol floods your brain's most critical memory component, the hippocampus — effectively downgrading your ability to quickly/ accurately store and recall information. Cortisol in your system over the long term has really nasty cumulative effects, all the more reason to neutralize the stress in your life. Brain health experts now believe the creeping cognitive decline, brain fog, and memory lapses we experience as we age are really because of our lifestyle choices — not the "grandpa is getting old" cop out. The great news is that you don't need to take pills or a get a medical procedure to have a good memory. The hippocampus, your brain's most important region for storing and retrieving information, is especially "neuroplastic" — meaning that it can strengthen and grow new cells, no matter your age. But, it must have the right stimulation. If you wanted to hit your tennis serve 110 MPH, you wouldn't sit on the couch praying for it to happen. No magical rain-dance will make you shower your opponent with aces. You have to train the exact muscles involved — with regularity and repetition. Likewise, if you want to boost your memory, you need to train your hippocampus. Art Kramer Ph.D. professor University of Illinois recently wrote "The bigger the hippocampus, the better you are able to form new memories." Prominent Harvard neuroscientist, Dr. Sara Lazar and colleagues, have studied the brains of meditators for years. Among many other monumental discoveries, her research shows that meditators' brains seem to always have well-formed, highly developed Hippocampi. In line with this finding, University of California Santa Barbara researchers found GRE (Graduate Record Examinations) verbal scores were boosted from 460 to 520... by practicing meditation for only 2 weeks! Even for learning and memory, meditation can reshape and forever innovate the areas of your brain to store and retrieve information no matter your age or history of bad memory. Give your brain the Pacific Ocean's storage capacity, discover meditation. The problem is, without fresh and new stimulation, your brain can't improve, grow, and develop beyond its current boundaries. Then, what's the best solution? The best tool for neurogenesis (growth of new neurons) is the one and only... meditation. As your high school gym coach drilled into your head, "use it or lose it" is not only applicable to your physical musculature — your memory also needs to be worked out with regularity. In an ever-growing world of Facebook/Twitter updates, shiny new blog posts, up to the minute breaking news, and other "click-me-now" mediums competing for our monetized minds — it is no surprise that our ability to focus and concentrate has taken a dive. In just over a decade (2000 to 2013), researchers have measured a whopping 33% downgrade in our average attention span, from 12 seconds to 8 seconds, one second shorter than that of a goldfish (9 seconds). By making it this far in the article, you can pat yourself on the back, as 17% of website page views last 4 seconds or less. It's quite normal nowadays to have 20 open browser tabs while only reading 10% of the page content — the endless rabbit hole of distraction made available to us by the internet is part of its lure and essence. The problem is when we apply this same principle in other areas of our life. Focusing on everything effectively leads to focusing on nothing, leaving you a master of nothing — accomplishing zero in the end. Why are we so "not-in-control" of our thought focus? It has been said that our senses are like five wild horses pulling a carriage, with the mind serving as the rein-holding driver. If you cannot learn to effectively harness the speed and direction of your senses, they can and will run wild on you, galloping randomly anywhere at anytime, dragging you against your will, kicking and screaming — to places you don't wanna go. Your ability to focus and concentrate comes down to how successful you are at taming, controlling, and eventually fully harnessing the incessant push and pull of your so called "wild horse" senses. Our ability to cultivate meaningful relationships, problem solve effectively, reach personal goals, achieve any kind of success, and innovate for a better tomorrow are all directly linked with our ability to focus our attention. Thankfully, there is an ever-green, time-tested, bulletproof way to re-train and re-focus the mind that works for everybody. It's called meditation. In much the same way that a river dam ensures the perfect amount of water is always available to downstream households, agriculture, and industry — meditation optimizes the flow of sensory information (remember the 5 wild horse senses?) that can reach your gatekeeping/ bottlenecking thalamus. In turn, without the distraction of having to micromanage the trivial day to day tasks of its components, meditation allows your higher function "CEO" cortex to think more deeply, clearly, while problem solving more effectively. With less stimuli and minimized arousal, meditation makes your brain much more efficient, armed with only the highest and best available information, while ignoring the information responsible for lapses in attention and other undesirable disorders like anxiety, ADHD, anger issues, depression, addiction, and Alzheimer's disease. Meditation also healthfully grows and thickens your brain's hippocampus/ frontal gray matter, while increasing its ultra-important "crinkles" and "folds" (gyrification), effectively strengthening the "spring-load" of your cerebral cortex. All of this extra coil catapults you to a world of amazing benefits: more positive and stable emotions, diminished age-related brain wear and tear, better information processing, more clear/accurate long & short term memory formation, better decision making, all while magnifying your focus & attention. In time, meditation strengthens your ability to confidently tackle any challenge with surgical precision, illuminated by clear, sure-footed steps showing you how to get there. You will have the laser-like mind focus to immerse yourself in whatever you are doing, pouring your all into the task at hand. Luckily, no matter the height/ steepness of the mountain in your path, meditation will give you the unwavering, ultra-determined focus to reach the summit. Before opening your eyes in the morning, in the half-awake half-asleep twilight state, ever notice how your mind generates creative solutions, deep insights, (often bizarre) dream-like symbols/imagery, while having an almost omniscient quality? Or ten minutes into your morning shower, have you ever experienced a stream of einstein-like thoughts, striking like random bolts of lightning? Though 18th-century German physician and philosopher Ernst Platner officially coined the now well-known term "unconscious mind," psychological/ philosophical thinkers like Freud, Jung, Paracelsus, Shakespeare, and Nietzsche have always known that there is some kind of uber complex, multi-leveled hierarchy to the human mind. They also knew waiting just below the surface of their conscious mind is a dormant volcano of powerful thought energy just waiting to erupt — with a few of these thinkers even tapping into this force to produce their timeless, highly-influential bodies of work. Like an iceberg, there is a great deal under the surface of our conscious, everyday level of thinking — hidden from view. Best known as the "subconscious" and "unconscious," these powerful mind layers do much of our thinking's "heavy lifting," kind of like your Macbook's RAM/CPU quietly running 100+ background processes while you browse Facebook. An incredibly powerful tool, meditation is the secret to intelligently diving in, navigating, and effectively using this vast reserve of info to your maximum advantage. Data filtering. If our conscious minds' had to deal with the two-million bits of information we experience every waking second, we would be instantly overwhelmed, paralyzed by the sheer volume of data. Behind the scenes our subconscious mind effectively filters out all unnecessary information, ensuring only the most important and relevant nuggets make it to the surface. Creative insights. Anyone doing creative work has experienced the power of these awesome mind layers. Unlike doing something basic and mundane like arithmetic (conscious-thought), getting fully immersed or "in the zone" while you are drawing/ painting/ writing/ idea generating/ creating/ etc requires the conscious "ego" mind to take a backseat, allowing the super-creative deepmind to surface. When Albert Einstein was working on the modern theory of relativity, reports claimed that he would lay down on the couch waiting for inspirational thoughts to enter his mind. There are many highly successful people who credit meditation as their personal solution for highly transformative ideas. While we all want change in the world, the first thing that needs to change is “us.” Meditation bridges that gap wonderfully. Then, what is the best way to tap into this vast reserve of creativity, insights, and valuable information tucked under the blankets of our conscious minds? Meditation. Your freshly upgraded superman subconscious opens up a whole new level of mind mastery, effectively multiplying your potential as a human being — while uprooting whatever limiting thoughts, beliefs, and anything else keeping you from fulfilling your life-purpose. Meditation has no kryptonite.